Our podiatrists believe that most common conditions of the feet and ankles can be treated with conservative measures. Being proactive when it comes to your foot health is a vital part of your recovery. Informed patients make great advocates, and we value your role in this process. Don’t ignore pain—make an appointment at the first sign of a problem. How Can I Avoid Common Foot Conditions? Our doctors provide general foot care for conditions of the feet and ankles, but many of these problems could be avoided with the proper care. Start by checking your feet for signs of trouble. Changes in color, swelling, bruising, hot or cold areas, and cuts that don’t heal are just some of the indicators that should be addressed. Thoroughly washing and drying the feet on a daily basis will give you the opportunity to see and note concerns. Protecting your feet in public places such as locker rooms and swimming pools can keep them free from fungal infections. Fungal toenails and athlete’s foot can be stubborn, so wear a pair of flip-flops in these high traffic areas. If someone in your home has thickened, discolored nails, or itchy feet, do not share towels or shoes. Fungal infections are contagious, and can be spread at home as well. Proper hygiene is another important part of caring for the feet. Trimming the toenails with a horizontal cut will help to keep the nails growing in the right direction. If they are curved, they are more likely to develop into ingrown nails, which can be painful. Yes! Proper footwear is a critical component to overall foot health. Common foot deformities such as hammertoe, bunion, or bunionette are aggravated by shoes that are too tight or too narrow. Many people don’t realize that the feet often become larger with age. Have your feet measured and try on shoes for proper fit. If poor foot mechanics are causing your pain, custom orthotics that are made the old fashioned way may be an important step in ending your foot pain now. 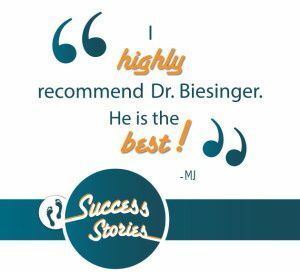 Dr. Levine will design a treatment plan based on your individual diagnosis and situation. Whether you’re experiencing symptoms of an infection, or the pain of a nail condition, we’ve got you covered. Your feet are a valuable asset, and we’re here to help you keep them in great shape. With three convenient locations, an expert staff, and an unsurpassed respect for our patients’ time and participation in the healing process; there’s no better choice for your foot care needs. Make an appointment today, or schedule online.